It's HOT!!!! I know we Californians complaining about the heat is funny to you guys in the Midwest or East coast, but really... its HOT! We haven't had a summer like this in years. It's humid and a hot 90 degrees in Southern California. We are used to our nice, warm 75 degree perfect beach weather. Well, apparently mother nature had another plan for us this summer. So what are we to do? Well, make popsicles to cool us down of course! Faye gave me a great gift this year for my birthday, an old fashioned, but updated, popsicle making kit! Well let's just say that with this unbearable heat, that popsicle kit and I have become good friends this summer. My mom always made us homemade popsicles growing up so I'm just going back to my roots. The recipe possibilities are endless! But I am going to start you off with a simple and delicious one! Cantaloupe is really cheap right now at the stores. I picked up this one for $.50 the other day and with those .50, I made 12 delicious popsicles. A cool treat for under $1.00, honestly who can beat that? 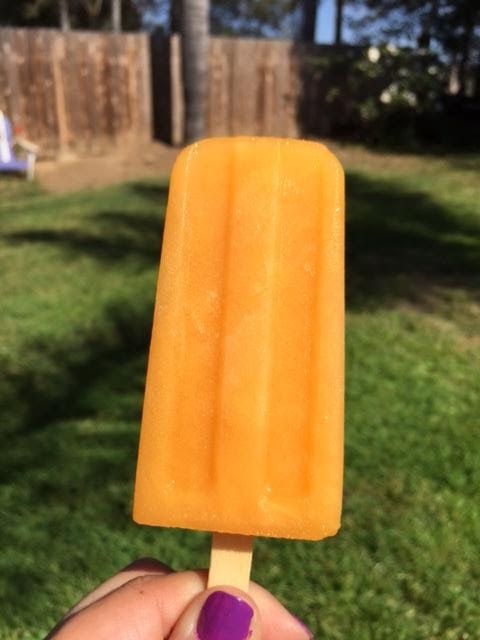 Ok... back to the Cantaloupe and Lime Popsicles.. these are so good. They are sweet and tangy, a perfect combination of summer flavors. They have the perfect consistency when you remove them from the Popsicle mold. Nice and solid, so very easy to eat. I really hope you give these popsicles a try and cool down your summer a bit. Combine 2/3 sugar and 2/3 water in a small sauce pan. 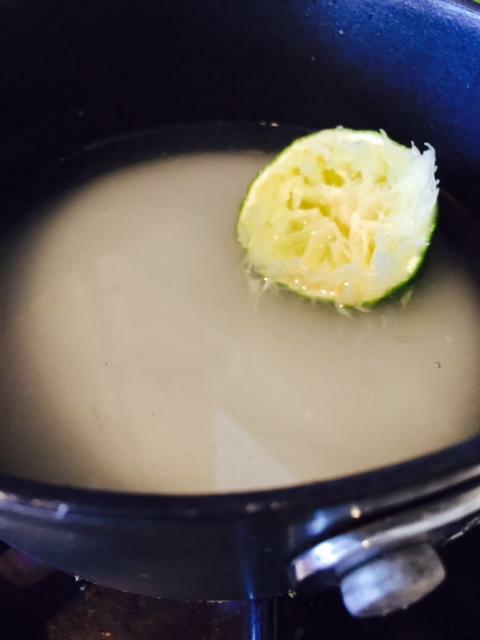 Add the juice of 1 lime and then 1/2 of the juiced lime. Cook at medium-high heat, stirring so that the sugar doesn't stick to the bottom. About 5 minutes until sugar has dissolved. Cool until warm to touch. Cut and seed the cantaloupe. 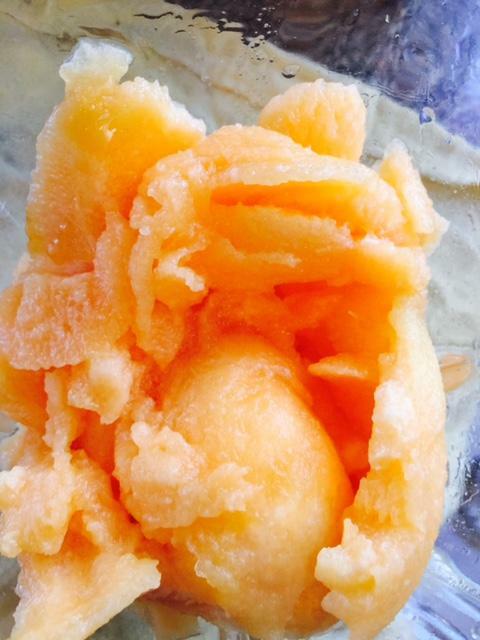 Put the chopped cantaloupe into a blender and discard the rind. 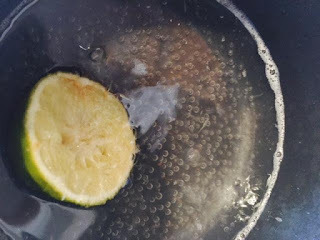 Add the cooled lime sugar into the blender along with 1/4 cup of water. Blend on high for about 2 minutes until smooth. 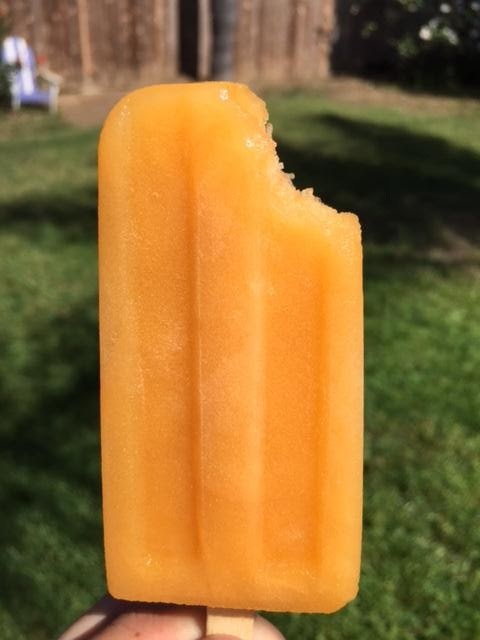 Pour cantaloupe mixture into Popsicle mold. Add popsicle stick and freeze for about 5 hours. Overnight is the best. Who doesn't want donuts for breakfast? But, I have to admit, sometimes you just don't want to make the effort to get dressed and drive to the donut shop. Well, the good news is you don't have too! You can make amazing donuts at home in your pj's! 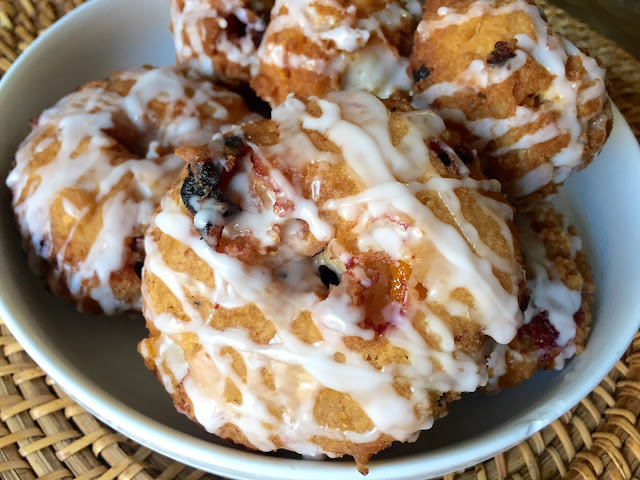 I've already posted the recipe for these amazing baked donuts made with homemade blueberry jam swirled in (click here). Soooo good! But the recipe I am sharing today is for fried donuts. Yum...fried. A little more work, but definitely worth the effort. In a large bowl, combine the flour, sugar, baking powder, salt, cinnamon and nutmeg. Whisk to combine. 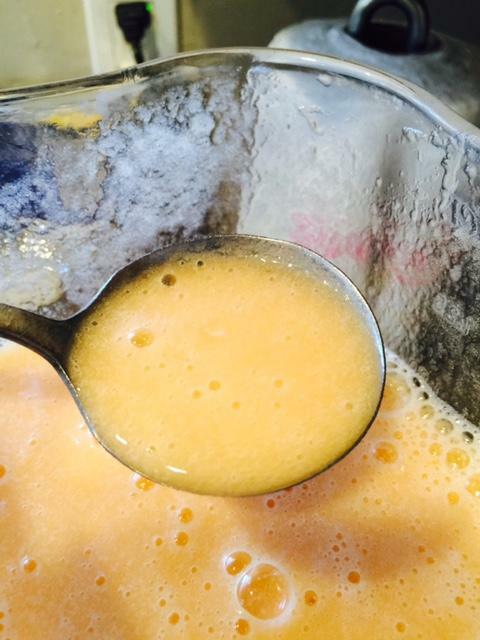 In a small bowl, combine the egg, milk and vanilla extract. Set aside. Add the melted butter to the dry ingredients and stir to combine. The mixture should look like small crumbs. Add the egg/milk mixture to the flour mixture and stir lightly just until almost combined. Add the blueberries and peaches and fold with a rubber spatula to combine. Place the mixture on a floured surface and roll/pat the dough until about 1/2" thick. Cut into donut shapes using a biscuit or donut cutter. If using a biscuit cutter, cut holes in the center of each donut with a knife or a frosting piping tip like I did. An alternative option is to make fritters by just scooping the dough using a small scoop instead of rolling it out. Heat oil in a large pot or deep fryer. I used my heavy Dutch oven with about 5" of oil. Oil temp should be about 375f. Fry donuts 2 at a time until golden brown and cooked though, approx. 1 1/2 minutes each side, flipping when the first side is done. If making fritters, fry 3-4 fritters at a time. Cooking time will vary. Checking for doneness after the first donut/fritter will give you a better gauge of the cooking time needed. Be sure to maintain 375f frying temp to prevent overbrowning and/or undercooking the donuts. Drain donuts/fritters on a paper towel lined wire cooling rack. 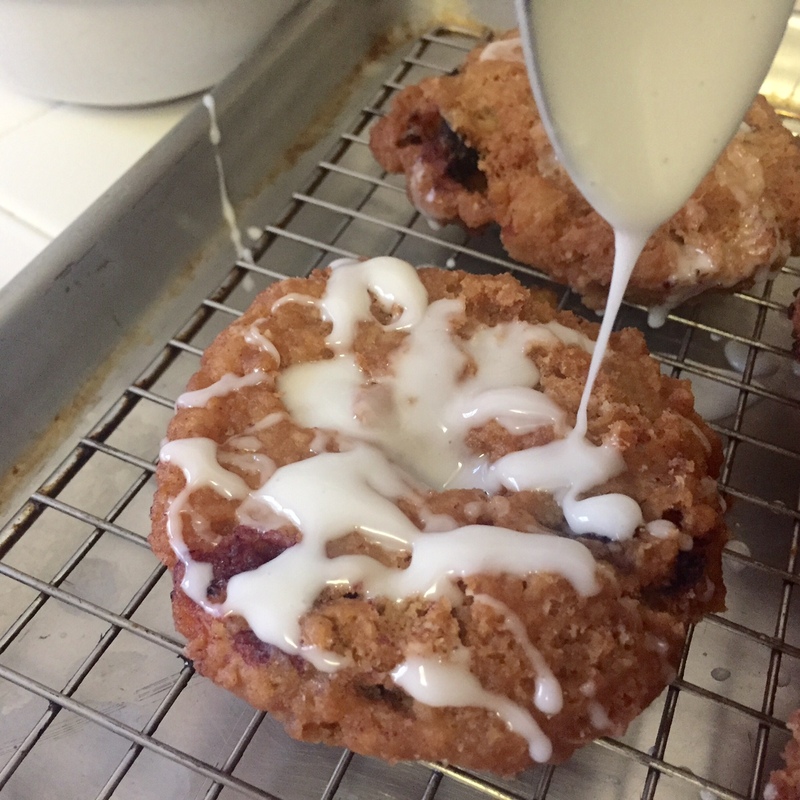 Dust with powdered sugar or make the glaze and drizzle over the donuts/fritters when donuts are only slightly warm. If your donuts are too hot, the glaze will melt off. To make the glaze: Combine the glaze ingredients in a bowl and stir well. Adjust to desired consistency. The glaze should be thick but able to be drizzled with a fork or spoon. Add a little more liquid, a little at a time, if needed being careful not to add too much. 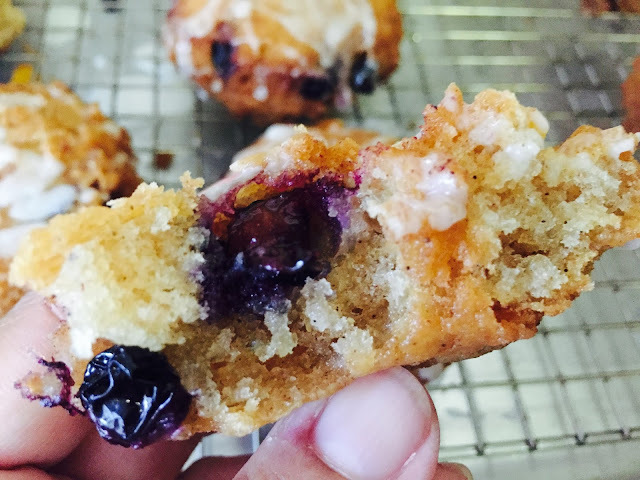 These donuts are best enjoyed immediately after they are made. For this month's Leftovers Club, our theme was chocolate! 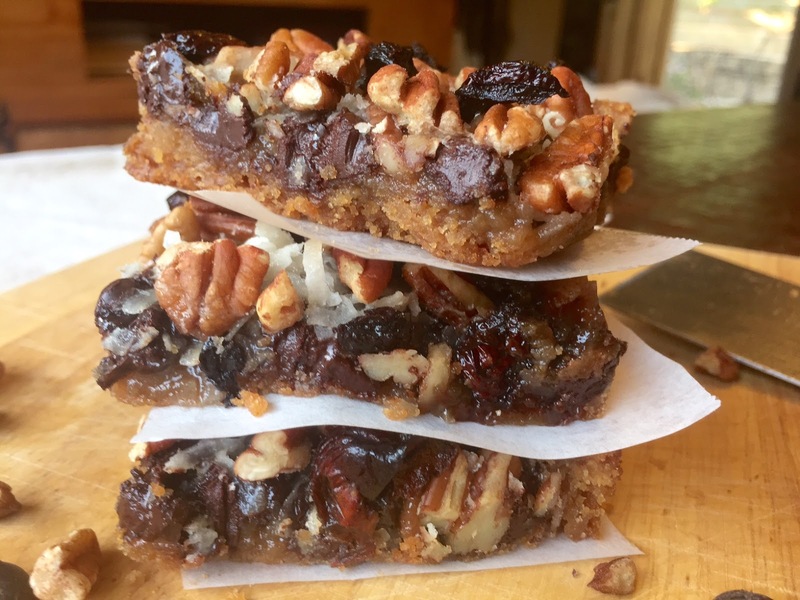 Now, don't get me wrong, chocolate has to be one of my all-time favorite things in life, but coming up with a dairy-free chocolate recipe for my partner, Ginger from Stark Raving Delicious, was a little challenging. Plus chocolate can be hard to mail in the Summer! 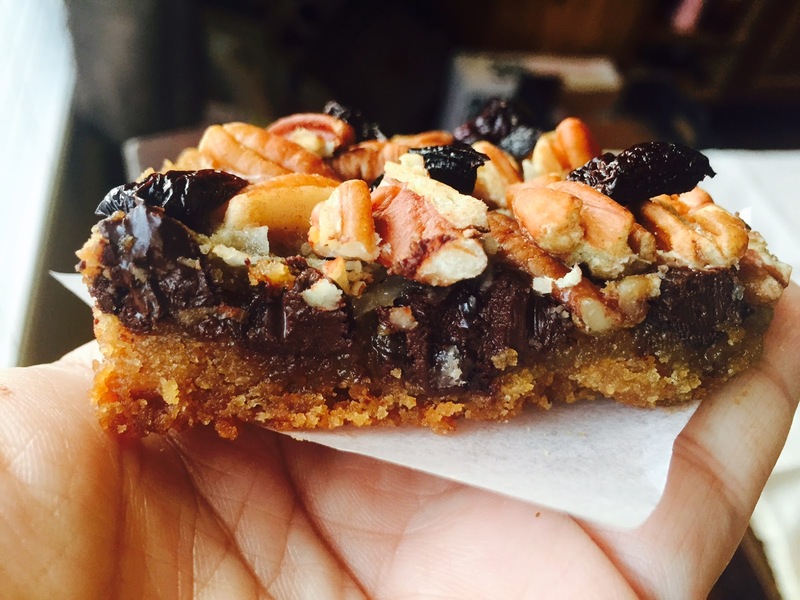 I knew I wanted to make some type of cookie bar, easy to make, easy to ship, easy-peasy, right? And what cookie bar is more classic than the iconic Magic Cookie Bar? The challenge was making a dairy free version. Everyone knows that one of the main ingredients in Magic Cookie Bars is sweetened condensed milk. It's the "magic" that holds all of the ingredients together and creates the cohesive bar. 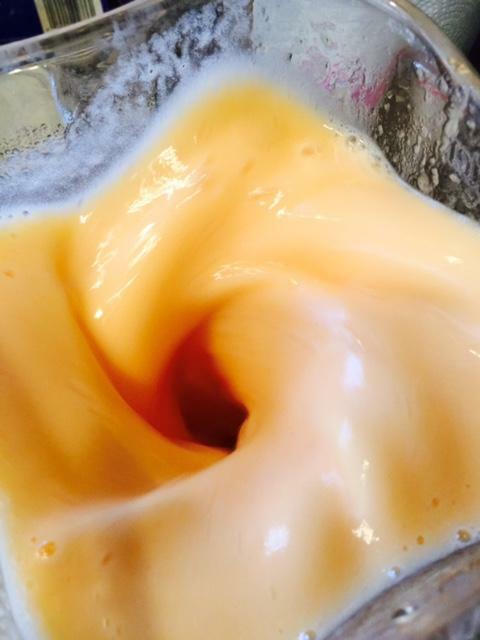 So how to make dairy-free sweetened condensed milk? Well, it turned out to be easier than I thought. Just use dairy free milk! 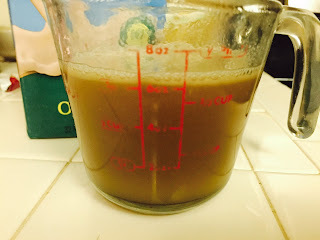 I cooked almond milk and sugar until it was reduced down to a syrup like consistency. Done deal! One of the other issues with Magic Cookie Bars that I wanted to address was that they can often be too sweet. To remedy that, I used dark chocolate (dairy free of course), coconut for texture, pecans for crunch, dried cherries for tartness and Maria Cookies, which aren't too sweet, for the crust. Sounded like the perfect balance to me! I hope Ginger and her family enjoys my custom version of "Magic" Cookie Bars! Ginger wins hands down for cutest packaging. Check out what she sent to me and get the recipe on her blog. Place the almond milk and granulated sugar in a saucepan. Cook or medium heat stirring constantly until the liquid is reduced to 3/4 cup and is a syrup like consistency. Remove from heat and allow to cool to room temp. Line a 9"x9" baking pan with nonstick foil or line with regular foil sprayed with nonstick spray. Place the Maria Cookies in a food processer and process until crumbs. Place the cookie crumbs in a bowl, drizzle the melted Earth Balance over the crumbs and combine with a fork. Press the mixture evenly into the bottom of the prepared baking pan. Sprinkle the chocolate chips evenly over the crust. Then sprinkle the coconut over the chocolate chips. Pour the sweetened condensed almond milk over the coconut/chocolate. Sprinkle the pecans and chopped cherries on top. Bake for 30-40 minutes or until mixture is set and crust is golden brown. Remove from oven and allow to cool completely before removing from the pan and cutting into bars. Store leftovers in an airtight container at room temperature for up to 2 days.